Office jobs make for some of the most successful scenarios for mothers to pump their milk for their babies, especially if women have an office with a door they can close and lock. But really, most women working in offices actually work in a cubicle that does not offer much privacy. Many large offices have lactation rooms mothers can use–unfortunately, these often book up quickly or else involve a long travel time from desk to door. Here’s a collection of tips from real moms who have pumped from their cubicles around western PA.
Use a nursing cover. Real mom Janine was able to pump whenever she felt full by using a nursing cover and just staying at her desk. Christy M had a lactation room available at her job, but it was located in an attic and she didn’t have the time or desire to climb up there to pump. She used a sheet with clips to block off her cubicle and kept working while pumping. Invest in a rechargeable battery pack. Ginny K points out that there aren’t always outlets to spare, plus the long power cord that comes with the pump sometimes drags on the ground, which can bring grody floor grime back into your bag when you pack up all your parts. Charlotte Y points out that if the office can’t be trusted not to steal your lunch, they certainly can’t be trusted to leave your milk alone (hey what’s this…hey, this makes my coffee taste terrible…). She invested in a micro fridge to keep at her desk to keep pump parts and milk cold. No room or spare outlet for a fridge? Make sure to invest in a roomy cooler with space for ample ice and multiple bottles! 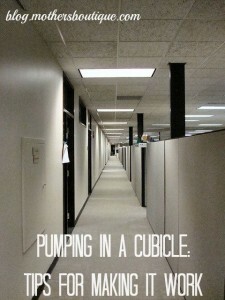 Did you pump in an office setting? Leave us a comment to share your best tips for other moms! Image by Dennis Matheson via Flickr.